Members of UR Club Rugby participate in a drill at practice in the field house. The UR Men’s Club Rugby team, known as the Uglies, who’ve won the state title two out of the past three years, is no exception to this claim. “For 80 minutes, you go toe-to-toe with the opposition, clawing for every inch, and when the final whistle blows, you dust yourself off, shake hands, and have a good laugh about the game,” senior and team member Ruairi Conway said. The game is known for intense physicality and barbaric nature. A typical rugby match lasts about 80 minutes. Senior player Patrick Fink agreed. For the team, chemistry on and off the pitch is crucial to success, and is as high on the list of priorities as refining skill and tactics. Another important factor for the Uglies is the strategic aspect of rugby, a sport that requires its players to study its complex tactics. The team accepts all new members, regardless of experience level. Rookies on the team are taken under the wing of veterans, who teach them the rules of the game and make them feel welcome. 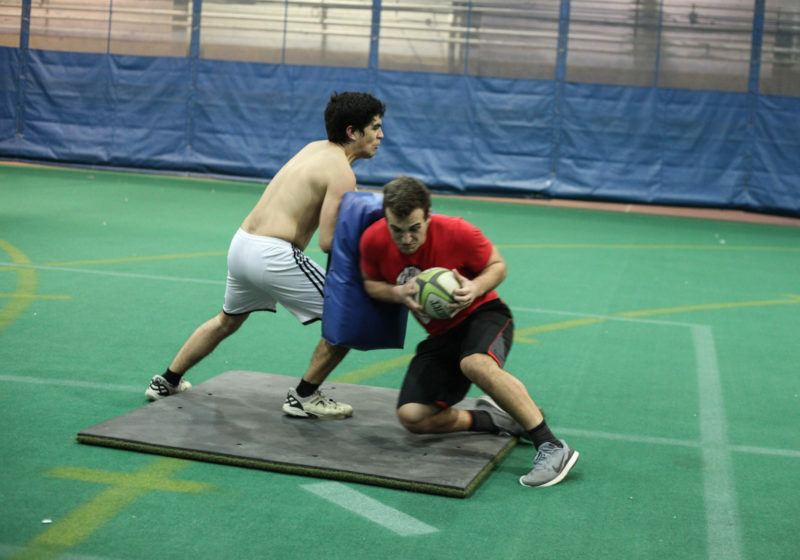 Joining the Club Rugby Team at UR was freshman Dylan Collin’s introduction to the sport. Fink began playing rugby in high school. . Senior Ruairi Conway played rugby for ten years before coming to UR. He took up the sport in Ireland, his home coutry, because of the its popularity among his classmates. “Fortunately I learned to love the sport itself and will definitely continue to play after I graduate,” Conway said. During the primary club rugby season, the Uglies compete in the Nescro Small College League and play against both in-state teams and those in the broader northeast. In the fall of 2015, the team was ranked 13th in the nation in its division. This season, despite being a building year, it has a high level of talent on their roster. In the spring, the team begins its Sevens season, where each team plays with seven men on the pitch, rather than playing with 15 like they do in the fall. The Uglies will compete in several tournaments this spring, but their number one priority is competing in national qualifiers in Plattsburgh, N.Y., in April.